Get the best of both: spin intervals + bootcamp-style exercises = SpinCamp! Trust us, you’re gonna sweat! A full 30 minutes of spin intervals followed by 30 minutes of dryland exercises. This is a non-stop energy output class that will build your strength and stamina during the winter. 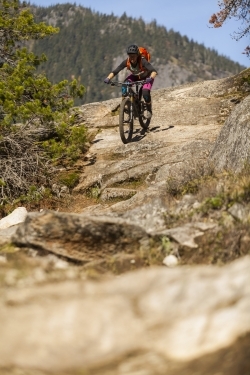 It’s guaranteed to give you a strong start to your mountain bike season! Whether you’re into biking, rowing, basketball, or any other competitive sport, this class will give you the advantage you need, to come out a winner! Add this class to your weekly routine and feel the burn! Warm up with mobility drills then dive right into an intense 40 minute workout structured to get your heart rate up and your muscles burning. Finish off with 15 minutes of foam rolling and stretching so you’re ready to attack your weekend! All exercises are ‘modifiable’ so everyone is welcome. Keep your fitness going between bike seasons with Sylvie's killer combo of spin intervals, abs & foam rolling. Enjoy (ha ha) 45 minutes of hammering out intervals on your spin bike, followed by 15 minutes of stretching & foam rolling to round it all out. All fitness levels welcome, no biking experience required.orkout that will leave you sweatier, stronger, and way more satisfied than working out on your own! Roll into your favourite summer sport with more energy and power.